Hand Sausage Stuffer and Pusher set. 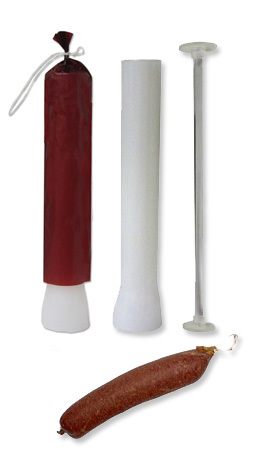 Ideal for making homemade summer sausage, salami, thuringer and all chub filled sausages. Accepts 1 1/2" and up to 6" fibrous or collagen casings. All parts dishwasher safe for easy clean-up. This item is great for making just a few pounds of sausage at a time.